So here is the situation. My husband loves chickens, and I do not (this has been well documented here). Somehow he brings home "just a couple" of chickens, and before I know it there are 30 chickens running around the yard. Our rabbits don't even multiply this fast. Our latest bunch of chicks are a few months old, and every day Daniel runs out of time before leaving for work, and asks me to feed them. So at various times during the day, I open the door and throw out rice or bread scraps or whatever is on hand. Rather predictably, I have conditioned these chickens to come running at the sound of an opening door. 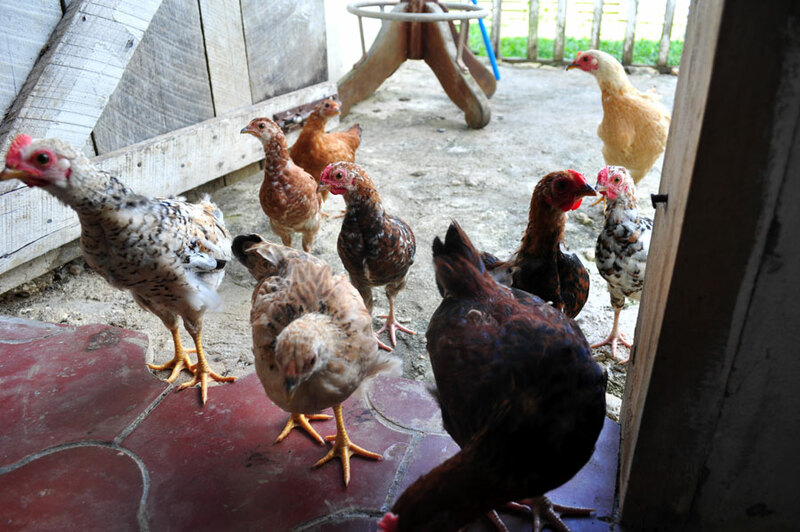 Sadly, these chickens also think it is their right to walk in the house-- perhaps to browse the pantry? Yesterday I was occupied with something, when the screen door popped open and a flood of chickens raced in, followed by the babes, who was chasing them using a belt as a whip and yelling "SHHH, SHHH!" (a noise they use here to herd animals). This was followed by 20 minutes of me racing around the kitchen, trying to catch scattered running chickens (before they left me any 'presents' on the floor), while being 'helped' by a belt-wielding toddler. Fun times here on the farm.